plays Girl, the lead role in Once, the new musical that opens on Broadway March 18, 2012. After graduating from Cherry Hill High School East in 2003, Milioti took acting classes at New York University while filling bit parts in national advertising campaign ads, particularly for Ford Edge. She began her Broadway career in 2006 as an understudy and replacement in The Lieutenant of Inishmore, a non-musical play, and continued in 2007 in the large cast of Coram Boy, a “play with music” by Adrian Sutton. Since then her primary focus has been on stage acting in off-Broadway plays The Devil’s Disciple (Irish Repertory Theatre, 2007), Some Americans Abroad (Second Stage, 2008), Crooked (Women’s Project, 2008), The Retributionists (Playwrights Horizons, 2009), The Heart Is a Lonely Hunter (New York Theater Workshop, 2009), That Face (Manhattan Theatre Club, 2010), Stunning (for which Milioti received a Lucille Lortel Award nomination, Lincoln Center Theatre 3, 2009), The Little Foxes (NYTW, 2010), and the pre-Broadway production of Once (NYTW, 2011). Once will mark her return to Broadway after nearly five years. 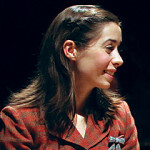 In the meantime, Cristin Milioti has not been absent from television or film. She played Catherine Sacrimoni on three episodes of the last season of The Sopranos, and has appeared in four other television series: The Unusuals (2009), The Good Wife (2010), 30 Rock (2011), and Nurse Jackie (2011). Her movies have included Greetings from the Shore (2007), Year of the Carnivore (2009), and four more as yet unreleased: Blood Relative (2011), I Am Ben (2011), Sleepwalk with Me (2012), and Bert and Arnie’s Guide to Friendship (2012).